If you aren’t already registered to vote, click here to do so before 7 June. To find out more about Labour’s campaign to remain in the European Union, click here. 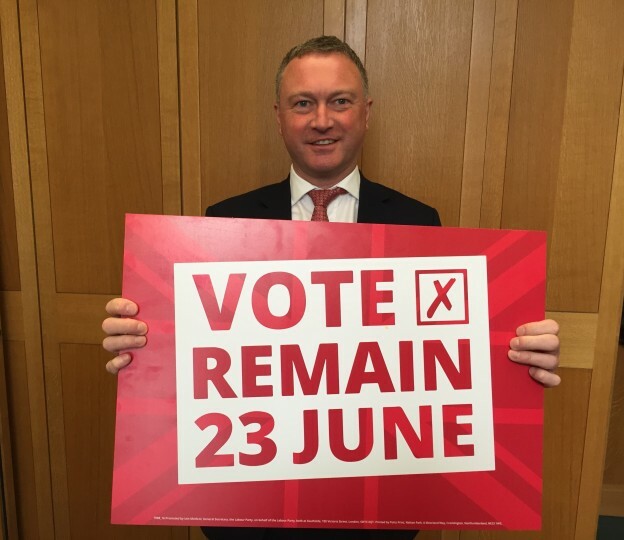 Croydon North MP Steve Reed will campaign for the United Kingdom to remain a member of the European Union. Steve believes EU membership benefits the whole UK, including Croydon North. The EU brings jobs, investment, better employment rights, and improved security to Britain. In addition, the existence of the European Union means European countries work together to resolve problems, bringing decades of peace to the continent after centuries of European wars. With powerful globalised corporations now expanding across the world, countries that stand alone risk being picked off with workers’ pay and conditions driven down. Working together makes Britain stronger in protecting our citizens and gives us a bigger voice in the world. Tory attempts to make British people work longer for lower pay have been stopped because we are members of the EU. European countries like Norway that are outside the EU still have to pay billions to trade with Europe and still have to accept the free movement of people, but they have no veto to block decisions that could damage them and no voice at the table to demand changes. Britain cannot be left in that dreadful situation. Steve has welcomed David Cameron’s renegotiation, but believes the case for EU membership goes much further. Steve Reed said: “Britain benefits massively by being a member of the European Union. One in ten British jobs is linked to trade with Europe, investment comes to our country because we’re inside the EU, and we are safer because we co-operate with our European partners on security and fighting terrorism.